Green industrialisation is not only about developing green jobs in some well delimitated sectors. It is about transforming and reinvigorating the whole European industry. True, the future competitiveness for European industry will be built on sustainability. But how much re-localisation and globalisation will this imply? A debate between Natalie Bennett, leader of the Green Party of England and Wales, and Reinhard Bütikofer, MEP and co-chair of the European Green Party. Green European Journal: In 2009 the Greens were really successful with the Green New Deal as a concrete answer to the economic crisis. Four years later, this story seems slightly less attractive. A possible explanation is that we were maybe not clear enough on the kind of social relations induced by the Green New Deal and the way we wanted to finance it. Do you share this analysis? Natalie Bennett: To start off with, the Green New Deal was the right approach around the time of the last European election and we certainly need to continue to talk about “green jobs”. In the British context we need to do a vast amount in terms of insulating homes, investing in renewable energy, investing in public transport and indeed in essential public services. But in 2013, we also need to have a much bigger transformation of the way the whole economy works. This is particularly extreme in the UK because we have an economy that is even more exposed than most of the rest of Europe to the global economy. In terms of food and manufacturing, for example, we rely very heavily on imports. So the next step is to recognise that globalisation has hit the buffers, both economically and environmentally and that we need to re-localise our economies. In my context, that means bringing manufacturing and food production back to Britain and creating strong local economies in which the money goes round and round locally. In terms of the social structure, it means an economy built around small business and cooperatives. It is an economy where the multinationals do not reign over everything and a society in which inequality is dramatically reduced. Reinhard, do you agree (and hopefully not, or we don’t have a debate)? Reinhard Bütikofer: Look, I always love to pick an argument, but let me start by saying that I strongly believe that we should stick to the Green New Deal paradigm. The three different dimensions which we set out to promote under this policy, namely, macroeconomic reregulation; social inclusiveness and a new development for the real economy, are still pertinent. However, I would hold that we have made some progress and we should show that in the upcoming European elections, with regard to how we deal with industry as such. A lot of work has been done by Greens – more than in the past – to really sit down with industrial actors and to come up with new ideas regarding the real economy i.e. manufacturing, or what we call in Germany “Industrie”. There is a different usage of the word in the UK. RB: There is a dual task of reinvigorating industry and at the same time changing the growth paradigm. This is not a simple task, but we have to deal with both at the same time. I see a window of political opportunity in discussing industrial policy for a couple of reasons; 1) The crisis has demonstrated that in some of the member countries of the EU where policy makers have been able to hold on to manufacturing sectors of the economy better than in others the ability to get safely through the crisis has been stronger. 2) Europe finds itself confronted with increasing competition by newly emerging industrial powers. We used to speak about threshold economies. But this no longer is an adequate description. They are newly emerging industrial powers and they do apply strong industrial policies of their own. So Europe has to step up to the plate and acknowledge: we have to develop a common industrial policy, too. It has been very important for us Greens to stay away from a false definition of what a green economy would be or what green jobs would be. Green jobs are not just jobs in rehabilitating our housing stock or building windmills or putting solar panels on the roofs. Green industry isn’t just renewables and LED lights. Any industry has the potential to transform into a green industry if it changes its energy source away from nuclear and fossil fuels, and improves its resource and energy efficiency through continual innovation and R&D. For example, the chemical sector – a traditional industry with which we Greens have fought many battles – could become a green industry by moving away from petroleum-based production towards sustainable bio-based feedstock and recycled materials. And we also have to confront the rebound-effect and the need to move away from our GDP-centric, quantitative growth models and instead move towards qualitative growth or green growth. 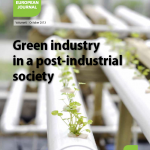 NB: I entirely agree: every industry needs to be a green industry. The phone industry is a good example for this. I was horrified recently in London to see adverts like “You can change your phone whenever you like”. We need to make things to last. This doesn’t mean you can’t upgrade your phone every six months by downloading some new software. Therefore we need to move towards a different kind of structure where things are made to last. It’s worth remembering that historically this isn’t an unusual or new thing. When they got married my grandparents bought a suite of furniture for their house and they were expecting to pass that suite of furniture on to their children. But one of the points we differ on is the issue of re-localising. For me, globalisation clearly has hits its limits. China really starts to focus on developing its own internal markets and developing a much more localised economy. There is a term appearing increasingly in the Financial Times, ‘re-shoring’, the opposite of off-shoring. It is also happening in my country: my favourite example, although it is not a very green example, is the pot noodles, a plastic bowl with some instant noodles in it and you pour boiling water on it and you have a meal, where the production of one brand moved back from China to Britain, not for environmental reasons but financial ones. NB: But re-localising is going to happen, regardless of any policy decisions. Wages are rising very fast in the newly industrialising countries, and transport costs have soared and in the era of Peak Oil will not come down. And there’s an increasing recognition in the business community that long fragile global supply chains are not really secure. Globalisation has hit its limits and we’re seeing a natural reshaping as a result of that – what we have to do is encourage and develop that tendency. RB: I do not agree with the prediction that globalisation has run into the wall and has to be rewinded. I do see the reality of re-shoring in the US. But it is happening for reasons that as environmentalists we deplore. Some of it is happening because they have extremely low energy prices due to shale gas. Re-shoring is by far not an equivalent to localising or re-localising. And for China it is a bit difficult to talk about localisation because they are building major industrial conglomerates that are not very local. If I may use the example of the renewables industry, I would argue that an over emphasis on localisation could even run counter to environmental goals, because it would undermine and limit the efficiency of the transition. We have some experience in Germany with promoting the renewable sector. We have come to the conclusion that we need a good mix of decentralised local energy production and a fair integration with a pan-European grid. Without this large scale integration the volatility of the energy generation depending on whether the wind blows or whether the sun shines would necessitate the building of huge back up capacities, – fossil back up capacities. Whereas, if we have a well-integrated grid and rely on the ability to transport energy generated let us say along the Scottish or the Spanish Atlantic coast into the pan-European grid, that would help us creating efficiencies in combination with the decentralised energy. This is for me a good example of a fair balance between players on different levels. Small companies, SMEs, family owned businesses are very important and I do agree with putting an emphasis on local or regional value chains. Where we can, we should preserve them or re-establish them. But are they really able to export goods beyond Europe? RB: Look at the most successful SME in Germany, a lot of them are known as the so-called hidden champions – small family owned businesses, headquartered in villages – that have a share of 30, 40, 50 per cent of the global market in a very small niche. Their particular strength and their contribution to the local and regional economy depends on their interwovenness with the global market and if they were to be cut off of, immediately that successful economy would completely crumble. So I think it’s the balance that we have to promote. NB: I would not disagree with that at all. I’m not talking about autarky or anything like that, but about making goods at the appropriate level of localisation. My focus is particularly on the basic essentials, food, clothing, furniture, building supplies. At the other level, for example for some complex medical machinery, there might be one factory in the world that makes it. In terms of energy, I entirely agree with the need for the pan-European grid. But in Britain what we have a lot at the moment is a multinational company – very often a French multinational company – coming in and saying to the people in a village ‘We’re going to build a wind farm on your hill’ and people in the village aren’t going to benefit at all and understandably they get upset about it and there’s huge protests. Whereas if you have that wind farm on the hill owned by the village there’s a whole different reaction. RB: That’s exactly the same in Germany. But you can entertain good hopes because in Bavaria – which is not the most progressive of all the German states – this philosophy has been adopted fully, even by the CSU grassroots. How do we finance the green industrialisation? RB: I think in the short term this is probably the most important hurdle for reindustrialising some of our regions in Europe. Many businesses do not have access to finance. NB: Yes. In Britain we have an extremely dysfunctional financial sector that’s focused on speculation and not on the real economy at all. And do you think that this financial sector can be re-orientated in order to finance all the sectors you mentioned, re-shoring of food, clothing, furniture, industry, is it possible or is it complete utopia? NB: Well I think one of the things we have to tackle first is the political influence of the financial industries, which are particularly relevant to the Westminster situation. There is increasing public disquiet on this. RB: We should be realistic in reckoning that the deleveraging in the banking sector that we’ve seen recently is going to continue. If we want to make our banks safer they have to underpin their lending with more capital which limits their ability to lend limitless. So certainly there’s going to be a problem. Some business lobby organisations have even advocated stopping the process of reforming our banking sector in order to make sure there would be enough lending to SMEs. In Germany we do not have a credit crunch. But in a couple other European countries like in the South it really exists. And if they do get access to a loan at all they will pay an interest rate that exceeds the German rate for a similar company by two, three, four per cent maybe. It is obviously pretty hard under such circumstances to restart the real economy. Therefore we have to come up with a couple of new instruments. In a very small segment for instance the crowdfunding strategy that has been successful for different project financing strategies in the US could be a part. RB: Look, you have a small carpenter or you have a trade in your neighbourhood and they want to invest in energy efficiency, they don’t have the money to finance the up-front investment and they are asking their neighbours to crowd finance. This is really happening and it’s working. Mosaic, for example, is a unique crowdfunding platform that allows people to invest in solar power. Of course there has to be regulation to make sure the investment is protected, but these are strategies where we have to apply new thinking. Another element could be structured covered bonds supported with SME assets. There have been projects where for instance public infrastructure banks teamed up with private sector banks. The private sector banks refinance themselves selling on these SME bond packages and the public sector banks pledged to take up some of the bond emission while the private sector bank pledged to increase its SME lending. This is really important and we have to show to the actors in the business community that Greens are willing to deal with these issues. NB: We have to focus on the fact that we can’t afford another crash. We have not yet done anything like enough to insulate ourselves against another 2007/8. Before we get to industrial policy we have to get to the point where we don’t crash the global economy again… That’s where things like the financial transaction tax and fight against tax havens are so important. Another form of re-shoring is trying to catch that capital and bring it back into a place where it’s useful and available to small businesses and cooperatives. There’s plenty of money being lent out in entirely the wrong directions. In the Green Party of England and Wales we’re very much focused on the fact that Britain effectively has two nationalised banks and they should be investing to actually support an industrial policy. I want to come back to the discussion with the industrial sector today, which is and will remain a huge part of the European economy. What are the ways of dialogue with these sectors in order to completely transform them and how is the European Union able to do that? RB: The European Union has limited competency with regard to industrial policy. Basically we are what Hollywood would call ‘best supporting character’. The main actor is still the nation state. But Europe can frame the discussion. My contribution is trying to convince people that future competitiveness for European industry has to be built on the basis of sustainability. So in the industrial policy report in my parliamentary committee I created the acronym RISE or ‘Renaissance of Industry for a Sustainable Europe’. It resonates with a lot of industrial actors, but runs into stiff opposition from a lot of lobbying organisations. We have a few friends, strong opponents and most importantly a vast majority of interlocutors that could be won over. Of course if we’re not preaching to the choir we have to use a language and a rationale that resonates with our audience. So, if I try to convince a company that they should invest in resource efficiency and they object to that because of the economic crisis they can invest at best if they have a return on investment within two years, then maybe we have to find an insurance mechanism to help them facilitate more long term investment. Of an average industrial product 2-5% of the cost is energy, 15-20% of the cost is labour, 40-50% of the cost is raw materials. Obviously, it would pay to pursue a raw materials and resource efficiency strategy. But unfortunately the European Union has been slow in acknowledging this. We have energy efficiency goals, but we do not have resource efficiency goals. The German material efficiency agency in Berlin calculated that if the best available resource efficiency technologies would be applied by German industry, it would save €100 billion a year in production costs! NB: We also have to look at ensuring that the shelf price of products reflect the actual, real cost of the products. To get to that point eventually, we probably need to change the value added tax away from being a simple gross figure towards one that rises or falls according to the environmental and social costs of products. It would allow “good companies” compete with those not doing the right thing by the environment or society. The company that is trading fairly with the developing world, that is investing in environmental sustainability and human resources, too often is still disadvantaged in trying to compete against the company that’s cutting every corner that it possibly can and doing all sorts of uncounted damage to the environment and society. RB: I completely agree with that. But we see presently that the emissions trading system which was originally invented to deal exactly with that problem is being destroyed. It will be very hard to offset the negative impact of the low Co2 price in the European market by positively motivating industrial policy. If we cannot set the basic competition rules right and if we keep subsidising emissions and fossil industries then it is very hard to see how a positive development could take off. The negotiations about the ‘Transatlantic Trade and Investment Partnership’ (TTIP) could offer an interesting opportunity in this context, because the G20 countries have agreed years ago to phase out fossil subsidies. Why couldn’t the US and the Europeans – representing 50% of global trade – come up with a common agenda of phasing out fossil subsidies just like the WTO did in the past with phasing out some agricultural subsidies step by step. That would be a great achievement in promoting green industry. The problem is that people do not consider the subsidies to fossil fuels as real subsidies. NB: But this is a struggle that can be done. In Britain we have the fracking debate at the moment. What the government did was basically slash the tax on shale gas. I have been to Balcombe (a village in Sussex opposed to fracking) and listened to members of the Tory party who were there supporting the protest camp. There is actually a political opportunity to win that argument. There is a figure put on global fossil fuel subsides of half a trillion dollars a year. RB: In Saarland – one of the smaller German states – that has been dependent on the coal industry for a long time, there was a public referendum in which a clear majority of the population voted against opening a new coal fired power plant, because they had had enough of all the negative impacts and of the coal dependency of their state. This is not easy and our good Social Democratic friends are not much of a help in this. But one of the issues that helped us in Germany was again the jobs factor. We demonstrated that the renewable energy industry had a higher jobs potential than the old, dying, coal industry. The other argument was the anti-oligopolies argument. We found that the interwoven character of the energy market, where a few major players basically control everything was standing in the way of the development of energy alternatives. So we were the only party in Germany that supported the European Commission’s unbundling strategy. We were pro-market, because we knew that to cut down on the privileges of fossil industries and of the major players would enhance the opportunities for renewable industries. How do we use the market mechanism to really help transforming our economies? This could be a very important discussion, for example between the French and the Germans. NB: The Green party in England and Wales is leading the way in promoting a levy on major supermarkets. Unfortunately we didn’t succeed in winning the argument in Bristol, which is both the most supermarket-dominated city in Britain, and also has a very strong small shop retail sector. The Bristol Greens were proposing a levy reflecting the damage the supermarkets do to the local economy: increasing traffic, low pay and putting very little money back into the local economy. That money would be used to promote local shopping centres. It’s rebalancing the competition. We didn’t win in Bristol, but we’ve seen enthusiasm from the small business sector in Yorkshire – it’s an argument that has great force. Eco-taxation remains a huge debate for the Greens. NB: An academic said to me yesterday that instead of talking about eco-taxes we should be talking about damage taxes. RB: We introduced an eco-tax when we entered the German federal government in 1999. Our experience is that you cannot rely on the positive effects of an eco-tax alone. You cannot raise it to the degree where you would have immediate effects, because the opposition to that would outbalance any positive effect. So, yes the eco-tax can contribute in setting the market conditions right, in levelling the playing field and internalising some of the external cost, but we need more specific policies on top of that. Sometimes people from the business community say: “look you’re doing these eco tax policies; you’re doing the Co2 market, “so why do you have specific policies supporting renewables or opposing nuclear, let the market do it”. I do not want to be misunderstood in that regard. Well, fact is without specific support for the nascent industry of renewables it wouldn’t have taken off in Germany.